Build your own pizza oven from a propane tank! Do you have access to old propane tanks? Then you can have yourself an awesome DIY pizza oven! We’ve featured a propane tank turned pizza oven project before, but this one is a simpler and easier project to do. It involves minimal modification, which is great especially for first time steel/metal DIY-ers. Its size is great as it is easy to carry or move around. It’s also not space-consuming. Do you need a propane tank pizza oven in your backyard? Start learning how to do this upcycling project by heading over to the tutorial linked below! Previous PostLearn how to build a plunge pool with pallets and an IBC! 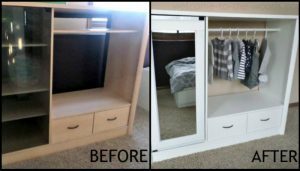 Next PostBuild a space-saving swivel storage cabinet !